My husband annoys me periodically by snarling at the TV while we are watching a perfectly reasonable police show. Based on his long-ago job in a peripheral law enforcement position, he gets worked up when the show’s cops do something that he says real-world officers would never do. I tell him that it’s just a little dramatic license. Who cares? He should be quiet and watch the program. Then, last night, watching a new favorite show, I found myself yelling, “No, no! That doesn’t happen.” And, “No, don’t pay! The bill is wrong!” And, more! 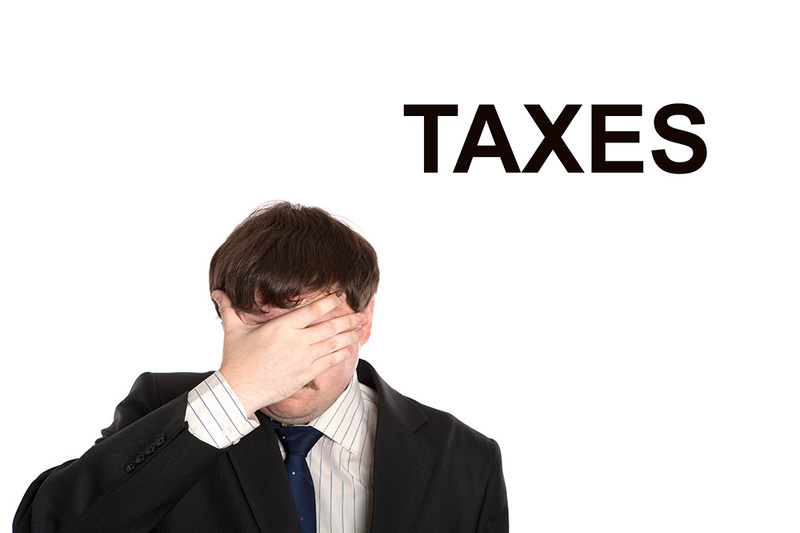 Most people don’t get their tax advice from comedy TV shows… I hope! But, still, the assumptions made by the characters on the show are the same misconceptions people who come to us for professional advice have. The blatant mistakes got me worked up! I enjoy the characters and witty writing of Netflix’s The Kominsky Method. But, the drama of the episode I was watching was based on one of the characters learning that he received a letter from the IRS complaining that he had not filed taxes for three years and they were billing him for $300,000 which he decided to pay. Wrong #1: The IRS does not wait for three years and send you one letter for all of the years you’ve missed. They send you a letter and a bill for a single year when they have discovered you’ve not filed for that year. Why would they wait? To make the total owed larger and dramatic? Only on TV! Wrong #2: When you don’t file a return (or you omit some information from a return you do file), the IRS assumes the worst. So, if the IRS learns from 1099’s or W-2’s that you’ve had income of $100,000, they will send you a bill for a tax on the full $100,000 without any deductions. They’ll also add on penalties and interest, even though in some circumstances you might be able to have penalties waived. When you get a bill like that from the IRS, the solution is to see a CPA and file your taxes. Claim your expenses, exemptions, and deductions! 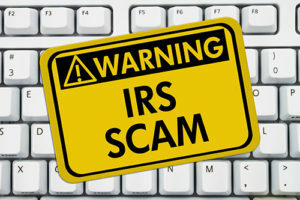 Don’t just pay what the IRS says you owe! But, in the TV show, what the IRS said the taxpayer owed was treated like it was written in stone. Then on the program, another character offered to give the money to the IRS for the person who hadn’t filed. But, the donor said, we have to call it a “loan”, so you don’t have to pay taxes on what I pay for you. Wrong #3: Gifts are not taxable to the recipient. So, there was no reason to call the gift a loan. Gifts over a certain dollar limit need to be reported by the donor to the IRS, and gifts may decrease the amount available to be passed on tax free in an estate. But, they are not taxable to the person that receives them. Moreover, calling something a “loan” when you don’t want or expect the money to repaid is lying to the IRS. No tax or legal professional would ever suggest lying. Neither should a television show! Okay, okay. I now understand why my husband objects so strongly to the harmless dramatic license on crime shows! When you see something on TV — or on the Internet — what happened sticks in your mind. You believe what the characters do in the show represent what reasonable people do. Don’t believe it! The Kominsky Method has lots of great moments. And, the episodes need drama, even if it’s a bit contrived. So, I’ll calm down and let the tax misstatements wash over me. But, if you get a notice from the IRS, don’t follow the Kominsky Method of dealing with the taxes. Call us! Not Good for Tax Deadline Day! 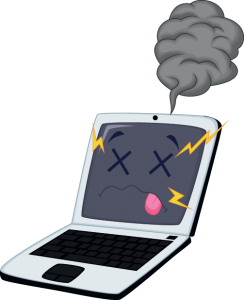 At 8:46 EDT on April 17, 2018 the IRS sent out an alert announcing their eFile systems are down. They ask that software providers not send any returns nor try to receive acknowledgements from the system right now. There will be a lengthy delay in retrieving acknowledgments once the system is back on-line. Taxing authorities that are independent of the IRS (FBAR, CA, TX, 5500, and some Michigan and Ohio cities) will be sent and process normally. The IRS will issue another QuickAlert when the systems are back online. Please monitor the IRS’ MeF Status Page for updates to this issue. Based on an Accounting Today article the IRS will be waiving all penalties for late filing caused by its technical difficulties today. As I work on the “paperwork” sent in by clients, I realize that we need to talk more about what a tax preparer wants — and does not need — to see. One long-term client really seems to enjoy the safe electronic file exchange portal. He sent me a group of files that include Excel spreadsheets, Word documents, PDF documents, and .jpg images of receipts. Wow! What a collection! I appreciate his thoroughness, but… Sending your tax preparer all of your raw information is like bringing in a shoebox of a year’s worth of receipts and dumping them on your accountant’s desk. In the prehistoric, pre-electronic days, we always had a few clients who would bring a shoebox of some type and have us go through the receipts, statements, and tidbits. They’d ask us to organize their records, and we were happy to do that. We’d have a junior team member, a bookkeeper or new accountant, create spreadsheets and pick out the data that would be needed on a tax return. This work was straight-forward, and the billing rate for the task was on the low end. But, today’s electronic data dump is worse than the old shoe box! 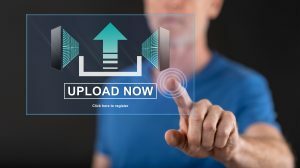 Because of the different types of documents mixed in the upload, we are finding that the traditional horde of bank statements, 10-99’s, payment records, and detailed detritus also has global instructions/questions that require attention from a stakeholder or other high-level professional in the firm. This means that I can no longer take the shoe box and give it to a bookkeeper for data entry. Instead, I have to open all of the documents, sort them, and answer the questions or follow the instructions sent in by the client. Sure, I can turn over the receipts and routine things to record, once I’ve identified them. Unfortunately, the time I spend with my sorting hat on can be significant! Happily, you can keep down the time we spend on the documents you give us (and therefore reduce your eventual cost). Here are some ideas on how to curate the collection of financial information you send us. Send a master list of what you’re uploading and why. If you have a Word document with questions/directions/comments call it out so that the senior person on your tax preparation team will read it first. If you have organized your finances yourself and have a summary of your income and deductible expenses, do NOT send in the receipts and statements. Keep the information you’ve processed and recorded with your tax records in case the IRS has questions in the next few years. But, if you send raw documents to us, it’s hard for us to simply ignore them. So, we will wonder, worry, spend time, and also possibly double count the numbers you already recorded. We do want to see the forms that the IRS gets from people you work for, financial institutions, and invest in. These are form like W2’s, 1099s of all flavors, K1’s, 1098’s, etc. 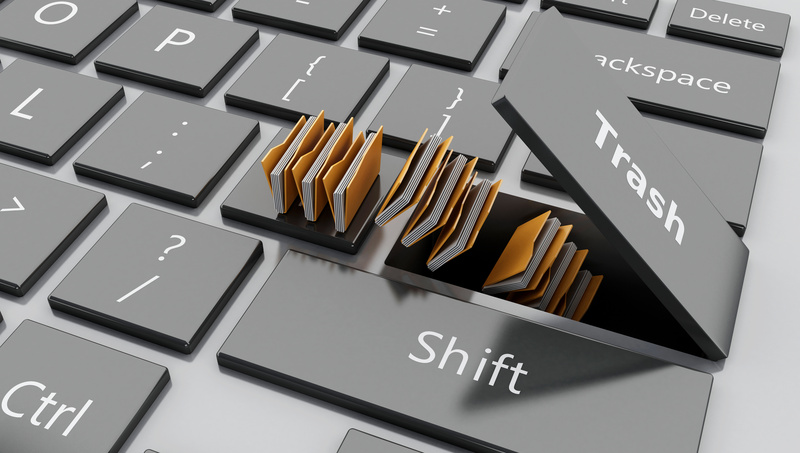 Technology has made it easy to share documents with your tax preparer. It’s simple to upload a lot and let the accountant sort it out! But, we read everything that is sent to us, so if you’re sending things because you’re thinking you’d rather be safe than sorry, you’re really asking us to spend more time on your return. So curate your collection of records. Show us only the really good stuff! “RINA accountancy corporation” is a regional full-service accounting and consulting firm with offices in San Francisco, Oakland and Walnut Creek, California as well as Bellingham, Washington. RINA serves closely-held businesses and their owners, high-net-worth individuals and families, and many not-for-profit organizations and private foundations. Sterck Kulik O’Neill became a part of the RINA team on January 1st 2018. Our office remains on Post Street in San Francisco and all Sterck Kulik O’Neill team members were asked to join the RINA firm. Sterck Kulik O’Neill merged with RINA to allow SKO’s partners – Charles and Geoffrey – to spend more time with clients and less time on administration and overhead duties. With the addition of SKO’s team, RINA now has approximately 100 Certified Public accountants and paraprofessionals. Charles and Geoff have been familiar with RINA for many years and have long admired RINA’s organization. The firms share the same professional focus: businesses and their owners. They also place the same importance on employee well-being and development. Charles and Geoffrey will be part of the RINA Sterck Kulik O’Neill management team. What will change for our clients? We believe that our team, especially our senior team members, will have more time to focus on our clients and their needs. We will also tap into RINA’s team for areas they have more experience than we have. We hope you’ll see increased responsiveness, proactive suggestions, consulting recommendations, and generally better service from your accountants! Letterheads, invoices, and other logos will gradually introduce the RINA name. What we don’t expect to change is our focus on you and your financial success. 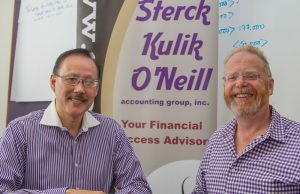 Effective January 1, 2018, Sterck Kulik O’Neill accounting group joins RINA accountancy corporation’s San Francisco team. Our relationship dates back to 1998 and our years of friendly interaction and mutual respect have led to this combination. We look forward to offering our clients greater resources; our team new opportunities for professional growth; and our friends and contacts new relationships to help each other. RINA’s President Ed Fahey believes the combined firms can better serve closely held businesses and not-for-profit organizations. RINA will maintain two offices in San Francisco into the summer and look to combine forces when one of the leases expires. Talk to Charles or Geoffrey, just like you’ve always done. They can be reached at the same number: 415.433.4500 ! 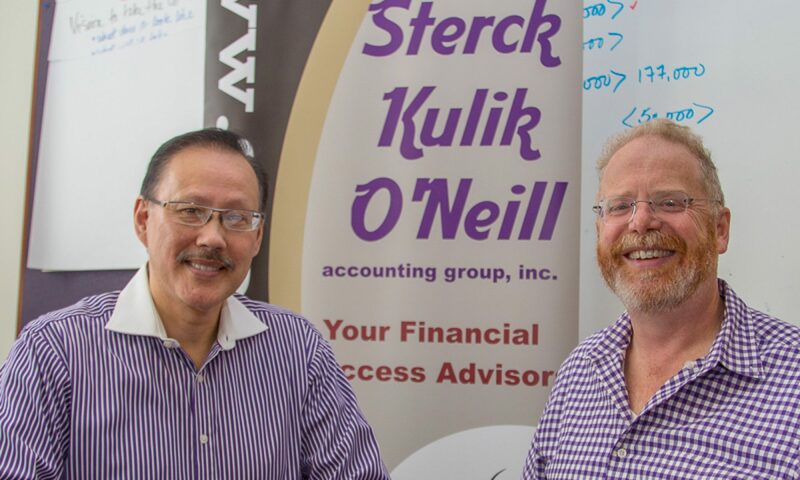 Sterck Kulik O’Neill accounting group invites prospective clients to a free introductory meeting in our office. Why? Lots of professionals charge the first time you meet them because they think their time is so valuable that they never want to give it away. If you go to talk to a surgeon, they will ask you to pay for your first appointment, even if you decide you don’t like them and don’t want them touching your body! These professionals don’t want to waste time on non-revenue producing activities. But, we think you should be able to meet us and see if you’re comfortable with our knowledge, personalities, way of talking, and our procedures before you engage us. So, we ask that you come in, explain to us what services you’re looking for, and see if you like interacting with us. For free! Do we understand the problem you’re bringing to us? Do we talk so you understand us? Do you like our ideas? So you can find out the answers to these questions, we offer prospective clients a free introductory meeting with one of our partners. Usually the first meeting lasts between a half hour and a full hour. You and the partner will talk about your overall financial situation and the pressing issue that made you decide to talk to a CPA. We’ll ask you to bring in copies of your most recently filed Federal tax return, if you’re looking for tax help. Or, copies of the business financial statements you’re getting now, if that’s the work you want us to do. Basically, the partner is looking for information that will let him estimate how many hours it will take us to do what you want. Then by the end of the meeting he will give you an estimate for the engagement. We want you to know the cost of the work you need before you spend any money. Oh, yeah. The free meeting is not a free hour of accounting services! It’s an opportunity for you to decide if you want us to be your ongoing CPA. Sometimes I have to disappoint people who tell me that they want their free hour of asking a CPA questions about their taxes and financial life. Your time is worth a lot, so we understand that by coming to an introductory meeting you’re risking your time. We appreciate that. But, we won’t charge you while you decide if we are the accounting firm for you. Plus, we will talk to you about your accounting needs before we set up the in-person meeting. In our phone conversation we will confirm that we do the work you’re looking for and think we might be a good fit. If you’re looking for a tax preparer, but your only income is W2 salary income, we will tell you we probably aren’t a good choice, and we’ll suggest some more cost effective alternatives. Or, if you really want to engage a specialist accountant who only handles art supply businesses (or whatever), we’ll tell you up front that we don’t meet your qualifications. We will try not to waste your time, if we aren’t the accountants for you! So if you are considering establishing a relationship with an accounting professional, give us a chance. 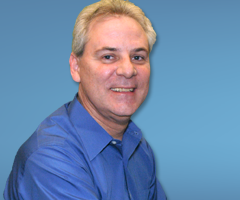 We think we give you a low-risk way of seeing if we are the right CPA firm for you. I am attaching a PDF with my W2 information for my tax return. Can you tell me how much it would cost for you to do my tax return. I am sending a PDF copy of last year’s return with this email. Hey, Charles. I have uploaded my tax information to http://bit.ly/my2017taxinformation . A few times a month we get messages inviting us to open an attachment to an email or to click on a link where we are supposed to get information a client (or prospective client) has sent us. We don’t click to open or follow! Even when the messages come from an email address of a client we know. Few of the messages we get out of the blue — from people we know and from people we don’t know — are legitimate! They are Spear Phishing attempts. Bad guys stuff malicious software in the PDF they are attaching in the hopes that our anti-virus software is weak or out of date. Or, they set up a web page that tries to download evil code to infect our computers, probably when we think we’re clicking to download the promised information. They can address us by name by picking off our identities and email addresses off the Internet. They can pretend their clients of ours because they’ve broken into a client’s computer and are accessing their list of contacts. These guys know their business and are hoping that someone will let their guard down for just a minute! And, the busy tax season time, CPAs are distracted. We are much more likely to CLICK without thinking. But, so far, no one in our office has succumbed to the temptation to click. We keep telling ourselves that our clients know not to send sensitive information by email — the data could be read and the ripped off by someone monitoring along the way. Moreover, we provide our clients with a secure portal to upload and download their information. Usually we don’t even respond to emails we think might possibly be from scammers. If the message is from a client, we may call and see if they really sent the message or suggest that their email has been hacked. 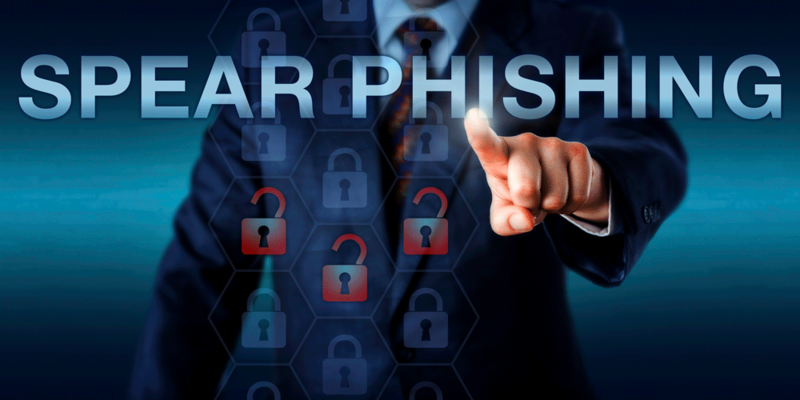 Of course, you should not email your social security number, private financial information, or even credit card numbers to anyone as a normal Word document, PDF, or plain text. It’s just too easy for a bad guy to monitor the Internet and help himself to your private info. So, use our portal to send information or contact for other ways to get delicate data to us! A neighborhood restaurant we went to nearly every week for several years got a new partner, a long-time bar tender who bought into the business. We’d been spending at least $5,000 a year there, going mostly on their slower nights. We knew all the staff, and had chatty, comfortable conversations with them. We thought we were good customers. Soon after taking over, the new partner changed the music to something I didn’t like. Loud and screechy, in my humble opinion. In a low-key manner I asked if he’d switched the playlist. After he said he did, I said — politely I think — that I thought the new music was not as good as what they had been playing. He responded, “Well other people like it,” and abruptly turned away. He has every right to play whatever music he likes in his restaurant. But his comment and attitude said he didn’t care about me. I paid for the one drink I’d just ordered and left the restaurant without eating. That conversation was in January and we haven’t been back. We simply disappeared from their list of customers. I’ve told this story to incredulous friends who know how loyal we were, and they’ve moved birthday parties and dinners away from that restaurant to other spots in the neighborhood. So, the new partner’s interaction with me — and the restaurant’s failure to follow-up — has cost the business at least $7,500 in 2017 revenue. I am not looking for sympathy or commiseration at being slighted. (Well maybe a little sympathy!) 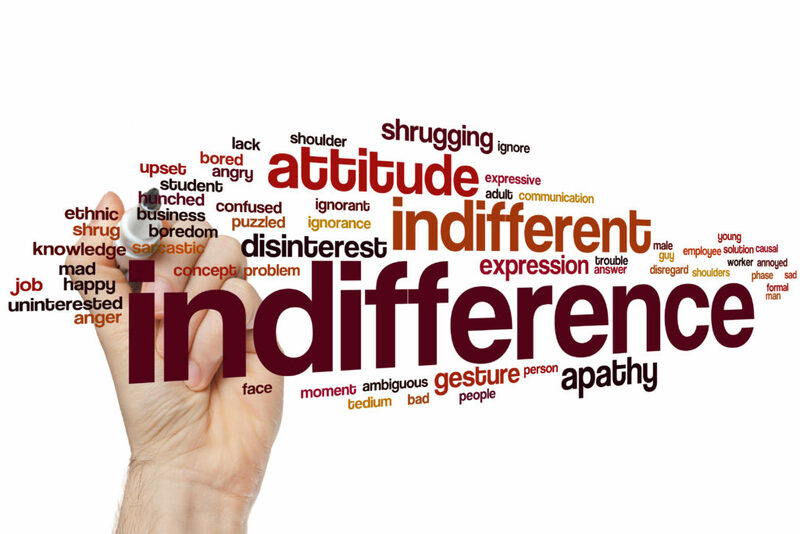 But, mainly I’m telling this story because it illustrates one of the dangers to your business that we explore with you in our business development sessions: Perceived Indifference Disease. When your customers perceive that you don’t care about them, you’re in danger of losing them. You may never know why they stopped coming. Our business consulting sessions help you uncover how your interactions with your clients may leave them feeling that you don’t care… even when you care very much! If you are wondering why you’re not getting the repeat business you deserve, we can help you explore ways of assessing your customer’s feelings toward you and seeing if they feel loyal or repelled by perceived difference. Contact us to learn more about the business development options we offer in addition to our traditional accounting services. Phony Treasury Agents are Calling YOU! Last week’s message on my cell was an automated voice from the “legal department at the US Treasury” demanding that I call them about my tax fraud that they were investigating. The recorded messages is so poorly made that most people would suspect that it’s a fake. The bad recording is good technique, though. Anyone scared enough or ignorant enough to think the recording is really from the government is a better than average mark for the crooks. In case you have any doubt about this recording — or about a more professional-sounding call, either live or recorded — the Treasury Department does not call anyone about taxes due. The Internal Revenue Service (IRS), the actual tax collection agency, does not call anyone about taxes due. They also don’t email you threatens about overdue taxes! The IRS will send you a notice via the United States Postal Service. That is how you learn that the government is questioning something in your return. And, the conversation never starts out threatening you with jail! Our team is working seven days a week to prepare taxes and to respond to other accounting emergencies of our existing clients. 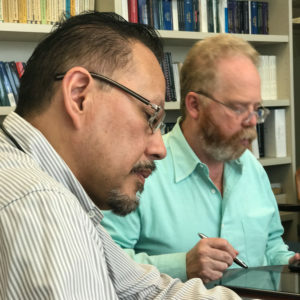 The partners want to make sure that the team is busy, but not crazed, and are now scheduling meetings for prospective clients after April 20th. Why April 21st or later? Because the normal deadline, April 15th falls on Saturday, there are holidays in various jurisdictions on Monday, the national tax deadline is April 18th, our office is closed April 19th, and the partners are already booked on April 20th! Whew! 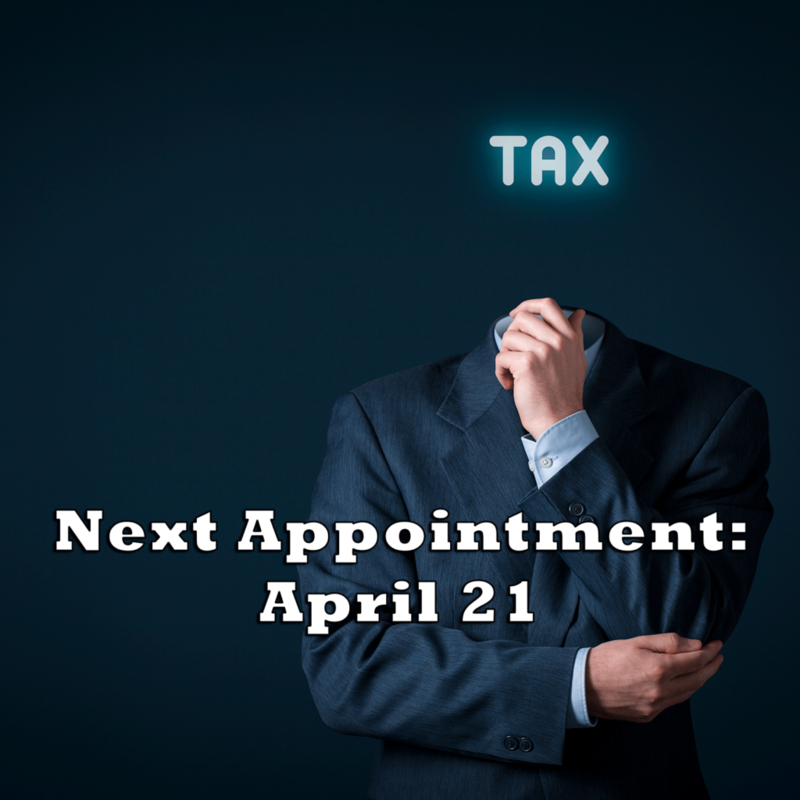 We are happy to schedule an appointment for new clients, but it won’t be before the tax deadline day. If you’re looking for help in preparing your return, give us a call. But, also stay in the good graces of the IRS by submitting an extension request. If you haven’t prepared your return and cannot get appropriate help by the April 18th deadline, we strongly suggest that you file an extension with the IRS. The IRS heavily penalizes late filers, but you can get extension to file automatically if you ask for one by April 18th. Download the Form 4868 from the IRS website, print it, fill it out, and mail it so it gets postmarked April 18th! 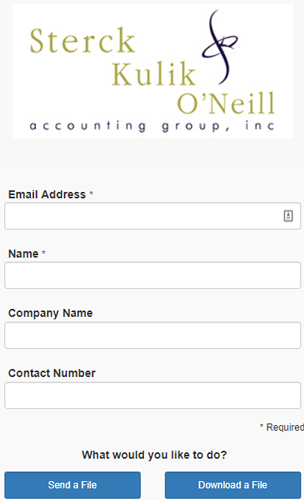 You can also electronically file an extension request on IRS page in the link. Filing an extension request will allow you until October 16, 2017 to submit your completed return. You are still required to pay any balance you owe the IRS by April 18th, so if you think you owe taxes make an estimate of what you should pay and send in a check with the extension form. Whether you plan on getting professional tax help or do it yourself, file the automatic extension request today! The penalty for not filing is nasty. If you file more than 60 days after the due date, the minimum penalty is $205, or if you owe less than $205, you’ll be penalized 100% of what you do owe. The penalties for failing to pay by April 18th are not so bad, generally 0.5 percent of your unpaid taxes per month, up to a total of 25%. That is a relatively small penalty, especially compared to the penalty for not filing! The IRS grants an automatic extension to file your tax forms, but the law requires that you pay what you owe by April 18. So, if you think you may have to pay the IRS this year, enclose a check to cover your estimated shortfall with the extension form. Want to talk to a CPA about how to handle a big windfall in 2017? Estimate what you’ll pay in taxes if you exercise those stock options? Do normal, intelligent tax planning? Unhappily, 2017 is not a normal year. Donald Trump and the Republican party campaigned on the promise to make major changes in the tax policy. The victors in the election campaigned on the promise that they would cut the top tax rates. They wanted to simplify the tax code, too. What “simply” means is not certain, but Mr. Trump’s proposal included the idea of limiting some long-cherished deductions. Charitable deductions would be capped at $100,000 per person, for example. Unfortunately for planning purposes, we do not know yet if cutting the tax rates and adoption of the other plans put forth by Mr. Trump will be done all in 2017. Moreover, the campaign promises of the Republicans in Congress differ from what Mr. Trump said he wanted to do. Which changes will pass? When? What other ideas will be implemented? Our crystal ball is cloudy! Realistically, the answers to these questions will develop during 2017. Unfortunately, actions that Congress takes in December will affect the financial actions you had to take in January. Advise you what the tax consequences of your actions would be if the 2016 laws remain in place. Advise you what the tax consequences of your actions will be as individual changes are made to the tax laws in 2017. Speculate along with you about what other tax law changes may be made and what the effects of those changes will be. Speculating is not a comforting alternative to solid, professional planning. But, it is all we all can do until the ultimate shape and scope of tax law changes is known for sure. We suggest that if you can postpone making major financial decisions that might be impacted by new tax rules, do put off taking any action until Congress acts! Unless you have need for the cash generated by the exercising of stock options, for example, consider delaying exercising the options for a while. Most years we suggest that you contact us early in the year to talk about potential major financial decisions. In 2017, we will still be happy to talk with you and give you general advice. As the year progresses, it’s likely that we will be able to give tax planning advice with increasing certainty.